What bonsai supplies do we need to grow trees successfully? Besides bonsai tools such as scissors, turntable, root rake, etc. bonsai fanciers still need many other fundamental supplies and accessories to take care of their plants. I'll show you the most commonly used bonsai supplies including: soil, fertilizer, humidity tray, wire, etc. Soils provide water as well as necessary nutrients, and help anchor bonsai trees’ trunk. 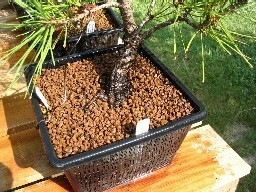 Preparing the workable potting mixture is critical aspect to bonsai growing. As a bonsai grower, you can easily purchase pre-made bonsai soil in bonsai outlets. Yet, you can also try making it yourself as long as you know the composition and the way to collect enough ingredients for the desired mixture. See more about Bonsai soils. Humidity trays are water-filled shallow plates with gravel or pebbles, on which you place your bonsai tree pots. Using a humidity tray is the perfect solution to keeping houseplants happy and healthy. They provide necessary moisture by way of evaporation when trees are placed on top and kept indoors. See more about humidity tray. Fertilizer is as important bonsai supplies that growers should put in their accessories list. The need for, and action of fertilizer on bonsai is no different than that on any other container plant or plant growing in the ground. Many people believe that fertilizer is food for bonsai trees. That’s not precisely true. Fertilizer is much more analogous to vitamins rather than nutrients. The real food for plants is carbon dioxide and water, which are converted to sugars and carbohydrates through photosynthesis process. See more about components, usage of bonsai fertilizer.